A spark plug is used to ignite the mixture of air-petrol inside the cylinder. A spark plug which is screwed into the cylinder head is usually designed to withstand a pressure of 35 kg/cm². Spark plug normally operates under 10000 to 30000 volts. To withstand such a high pressure and voltage, a superior quality spark plug must have to use in automobile engineering. You will find construction from below description. The core insulating assembly is housed in the steel shell assembly. The lower threaded portion of the shell which has 18mm or 14mm Dia. has ground electrode welded to it. The center electrode is screwed into the insulator at its upper position. The upper end of the center electrode is connected to the terminal which communicates with the distributor. When a high voltage is applied, the spark jumps in the small gap. This is provided between the lower end of the center electrode and the ground electrode. This spark is responsible for starting ignition in the cylinder. Platinum, nickel is generally used as electrode material. Because of its capacity to withstand corrosives, high temperature and has good thermal conductivity. The insulator should have a good thermal conductivity, chemical inertness to gases of combustion. It has also high resistance, be non-brittle and able to withstand high temperature and pressure. In recent practice is to use aluminum and silicon oxides also. In order to prevent the escaping of gases from the cylinder to the atmosphere. Suitable sealing gaskets are provided between the shell and the core insulator. Another steel gasket is also provided in the area where the steel shell is to contact cylinder head. The leakage of the hot gases past a defective or worn out gasket is likely to raise the temperature of the plug. 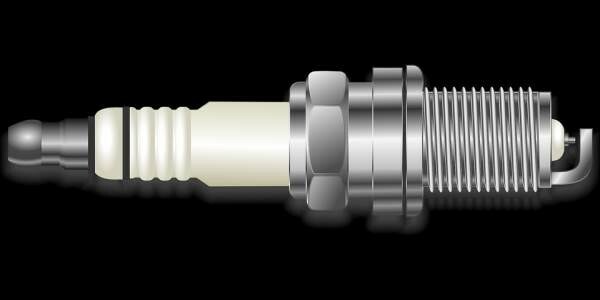 Generally, 0.3 to 0.6-millimeter gap is kept in the spark plug. Under special circumstances, a 0.7-millimeter gap can also be kept. The efficiency of the entire ignition system is greatly reduced both by too large or too small gap. Hence, the gap must be kept within the desired limits. The deposit of foreign materials such as carbon between the electrodes or on the outside of the insulator between the plug terminal and the shell is a source of nuisance and permit some of the high voltage to by-pass gap resulting in a reduced intensity of spark giving decreased engine efficiency. 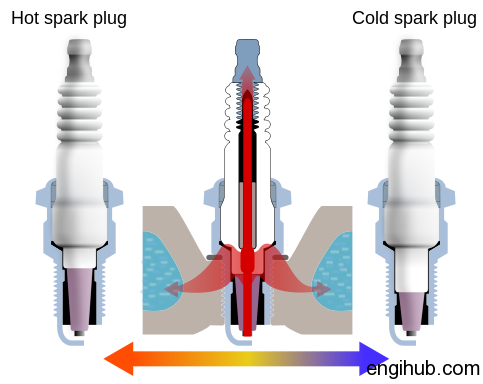 To avoid carbon deposits, we should have to operate spark plug above 400-degree centigrade. By bending the ground electrode, we can adjust the gap of a plug. In this spark plug, the path traced by the heat received by the plug, to reach the cooling cylinder head water is longer. So that the plug can be maintained at a high temperature to burn carbon deposits. It has a shorter insulating nose which increases the rate of heat transfer due to a short conducting path. This type of spark plugs is suitable for the engines, running a high speed and having high compression ratio.